NOSE: Whoa…Barleywines traditionally have an aroma of dark, sweet malt and loads of fruit. 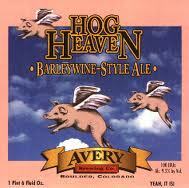 But the Hog Heaven’s nose is completely hop-forward. Big grapefruit and citrus notes come wafting out and almost drown out the caramel and burnt sugar smell from the malt. Surprisingly little noseburn from the fairly high alcohol content. TASTE: A little better balance in the taste. While the hop bitterness hits you immediately with massive citrus notes, it’s tempered to some degree by a big, sweet, toffee-like malt backbone. Some chewy dried fruit (prunes and raisins) show up in the middle and the finish is astringent and drying…though it tastes like it’s mostly from the hops, not the booze. DRINKABILITY: Low, but what do you expect from a Barleywine? Although, I would argue that the Hog Heaven has lower drinkability than many other Barleywines because it’s so damn hop-forward. It drinks like a Barleywine/Double IPA hybrid. Actually, that probably has a tremendous amount of appeal to a lot of Aleheads. Posted in Tasting Notes.Tagged Avery, Barleywine, Hog Heaven, J. Clyde. Had one of these tonight. Barleywine is usually not a favorite style, because I typically find them too cloying, but I like them when they’re hopped out the wazoo. This was the only Avery beer from the Dictators/Holy Trinity series that I had never tried, and I figured that, seeing as it’s Avery, there’s probably a good dose of hops. Needless to say, I was not disappointed. With a hop rate like this, it becomes almost like an Imperial Red Ale as much as it is a barleywine. I will say, though, that the best uber-hoppy “barleywine” I’ve had was probably from Half Acre. It was called Marty Stouffer’s Wild America, named after that old PBS show, and it was super hoppy. I brought a bomber with to Dark Lord Day and drank it with a bunch of strangers while we all stood in line for our brews.